Buried deep under her blankets, Connie woke to whooping and hollering from her little brother, who was clomping down the hall in boots, pajamas sticking out from the end of his snow pants. Jason tugged at the blankets, and Connie poked her head out. Snow! She jumped up and scratched at the frost on the window until she could see outside. The snow was deep enough to cover sagebrush and clumps of cheatgrass, turning the desert into a giant version of Connie’s own lumpy bed. With snow this deep, she knew the bus wouldn’t make it down the long dirt road and school would be canceled. It didn’t take long for Connie to join Jason on the hill, really just a bump no bigger than the family’s Honda Civic, but steep enough to ride a sled onto the alkali flat. When they got tired of sledding, they took turns pulling each other across the hard-pan until the sled tipped Jason into a tumbleweed. When Connie tried to help him up, he screamed that she had done it on purpose and began chasing her across the desert with part of the sticker bush until he gave up and went inside. Connie slipped around the side of the trailer and in through the back door, and called her best friend, Michelle. They liked to say they lived on the same street, and they did, technically. Connie lived at one end of Shadow Lane and Michelle lived at the other, and between their homes were four miles of washboard road, two stop signs and one abandoned sheepherder’s shack. Nothing else. Besides sharing a street, they both had annoying little brothers, they both were skinny, and neither had started growing breasts like some of the girls in fifth grade. Michelle’s mom had given her a training bra, which Michelle used to sling pebble-sized jackrabbit turds at her brother. Holding the phone to her ear, Connie stretched its cord down the hall and into the kitchen where her mom was pulling stickers out of Jason’s forehead. “Mom, Michelle invited me over. Can I go?” Connie asked. Jason grinned and Connie glared. The whole walk there, Jason complained. By the end of the first mile, he had pulled off his hat and gloves, and by the second mile, Connie was carrying his coat. When they reached mile three (the sheepherder’s shack), the snow on the road was beginning to melt. She yanked on his arm and squinted. 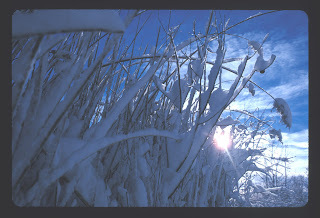 Sunlight bounced off the snow, bright and sharp as diamonds, stinging her eyes and making them water. Far off she could see the second stop sign, which meant Michelle’s home was close. Unlike Connie, Michelle lived in a real house, not a trailer, a two-story house nestled in hills that flattened into fields of alfalfa. From Michelle’s house they could walk to a ditch, choked by tule and cattails, and follow that finger of blue through the fields and into the cottonwood trees that lined the Carson River until it dumped into the Lahontan Reservoir. But now bare tree and dry tule were cloaked in snow. The four children sledded until the boys complained of the cold and went inside, leaving the girls to follow the tracks of rabbit and quail down to the frozen ditch. A small bird pecked at cattail fluff. Connie stepped onto the ice and feathery cracks spread under her feet. Michelle snapped off a column of tule and its dry husk released a small cloud of dust. She held it in her fingers like a cigarette. “Do you think you could smoke a tule?” Connie asked. Michelle shrugged. “It looks like a cigarette,” she said. They smiled at each other. Michelle ran back to the house for matches. Connie walked further out into ice and cattail, looking for tule as thin and round as cigarettes. The tall dry stalks folded and bent creating small chairs and couches to sit on, and that’s where Michelle found her. Connie shook the tule free of snow and Michelle held the match to one end. It smoldered, embers glowing and then fading out. A second match. Connie took a deep breath and exhaled through the tule, blowing ash and dust at Michelle. They threw themselves back into the tule and snow and hooted. “Noooo! Breathe in, not out. Here, let me try,” Michelle said. She put the end of the tule in her mouth, took a big puff as the match was lit, and spit out dust. Coughing and laughing she tossed the tule onto the ice. “This is dumb,” she said. The girls lay on their backs in the snow and looked up at the sun, at birds darting overhead, at the dusty snake of smoke from the house slithering across the sky. “Wanna try and kiss?” Connie asked. “Just for practice. So when a boy wants to, we know what to do,” she said. They rolled over so their faces were inches apart. “You have to close your eyes,” Connie said. They inched closer and bumped noses, red and a little runny from the cold. “I think we have to tilt our heads a little so our noses won’t bump,” Michelle said. “That’s what you’re supposed to do!” Connie said, giggling. They rolled away from each other, and stood up, eyes searching for something to settle on, something other than each other. They locked onto their brothers making angels in front of the house, and headed back through melting snow and scabby patches of desert. Prompted by Sunday Scribblings’ challenge to write about something forbidden. That’s wonderfully written. Glad I was able to catch it.